The 11 Best Serger Reviews: See My Top Picks for 2019! You want professional, perfect seams with no raw edges? You want speed? You want control? Serger sewing machines create flawless seams and trim off excess fabric with an adjacent, attached blade. For clothing, you can sew perfect rolled hems and flatlock seams. Plus, the seams are more durable with more stretch than anything you will sew with a standard machine. Guaranteed. Oh, they’re faster too! Brother 1034D 3/4 Thread Serger with Differential Feed: best overall machine. SINGER 14CG754 ProFinish Serger Sewing Machine: best affordable overclock machine for beginners. 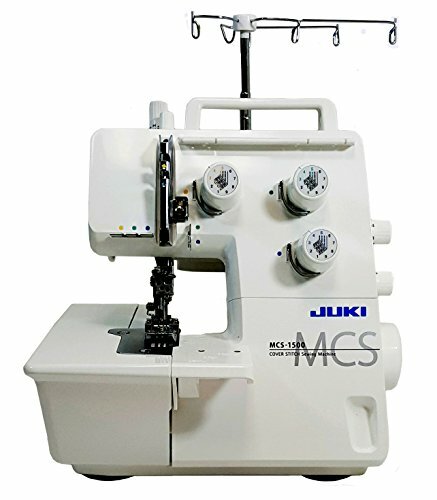 Juki MCS-1500 Cover Stitch and Chain Stitch Machine: best high end cover stitch sewing machine. Janome 1000CPX Cover Pro: easiest to use cover hem machine. 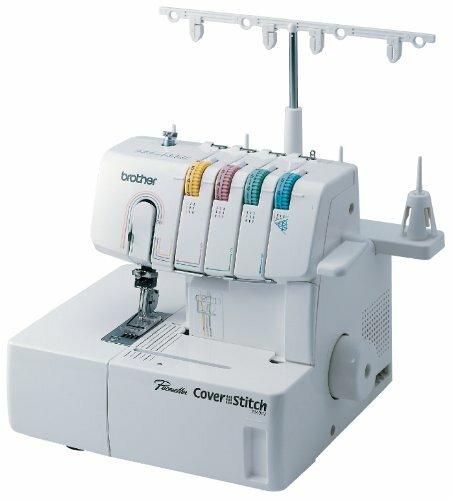 Brother 2340CV Cover Stitch: highest rated, mid priced machine. My top picks are based on a combination of features, price, warranty and overall value. Serger Vs. Sewing Machine: What's The Difference? The biggest difference between a serger versus a sewing machine lies in the seams. A seam sewn on a traditional machine will not stretch but a serged seam will. A serger is not meant to do many other tasks that can be done by top-end sewing machines, including facings, attaching zippers, topstitching, and creating buttonholes. A traditional sewing machine can often be used for quilting. Another primary difference between a traditional sewing machine and a serger is everything that falls under the rubric of 'finishing.' A standard sewing machine will produce raw edges all along the seam-allowance that a sewer will need to cover up with hem tape, trim with pinking shears, or finish up using a zigzag stitch. Hem taping is pretty but eats up a lot of time. Pinking shear trimming is both time-consuming and uninspired. A zigzag finish is unimaginative. You might not need a serger if you are happy with the overlock stitch on your sewing machine that manufactures neatly finished seams. What you get with a serger is added functionality. A serger will handle thicker threads for decorative stitching, and it can cut fabric, an important plus feature that traditional sewing machines don't have. This makes the serger a perfect choice for sewing knits, like the seams in a t-shirt or other fitted knit shirt. A serger functions primarily as a finishing tool for seams. The knife on a serger will first cut a clean fabric edge, and then it will use 3,4, or even 5 threads to wrap around the fabric's edge so it will be closed nicely and won't fray. The seam will look better and lay flatter. Sergers are also able to produce a clean looking extremely narrow rolled hem. Hemming on a serger is different from a standard sewing machine. A sewer will use a traditional sewing machine to do a double-fold hem on a woven fabric which will look neat, and there won't be fraying. However, that is not the best option for hemming knits, since the hem will end up bulky, will show signs of bubbling, and won't be able to stretch. A serger can be used to hem a knit fabric if you'd like the finished product to have either a lettuce effect hem or an edgy, deconstructed look. (If you want a smooth hem on knitted wear your best bet is to use a cover hem machine). One of the best qualities a serger has is that it's able to sew, cut the seam allowance and also enclose an edge in just one step. They're perfect for stretchy fabrics and knits, they cover stitch, they allow stitch stretch, they can make various decorative stitches, and they can sew different materials together. 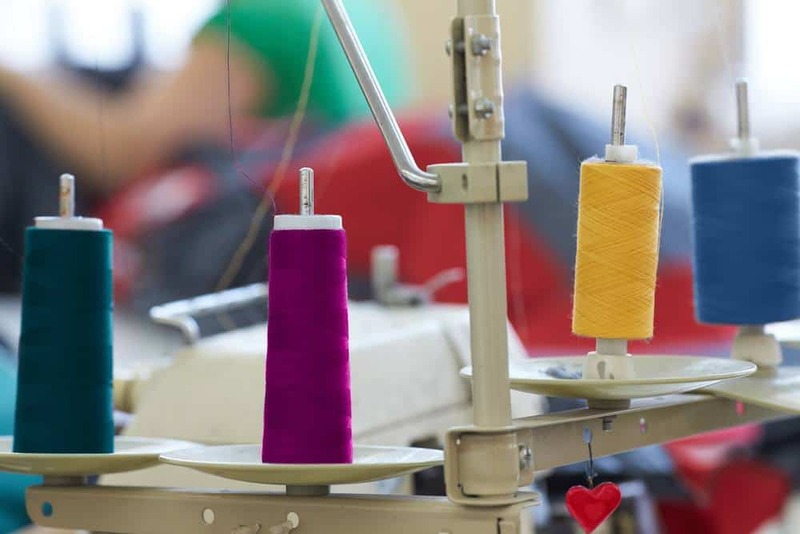 They often do flatlocking and chain stitching, they frequently have automatic threading capabilities, and they sometimes feature 4,5, or even 8 spools of thread! A serger, also known as an over-locking sewing machine, takes just one step to enclose and trim an edge or a seam allowance inside a thread casing. A sewist must decide what density and width they want for their projects (denser, wider options are usually more expensive). Thread use options should be considered next. Several of the sergers listed here provide a 2-3-or 4 thread option so sewers can choose the perfect thread amount for their seam. Most sergers come with differential feeds which will allow the sewer to create ruffles on lightweight fabrics or even waved edges. If you want to amp up your sewing projects, than you will want buy the best serger for you - that can create tight overlock stitches, ravel-free seams, and gorgeous decorative edges that will take your handiwork to a brand new level! If you are planning just to do simple, strong seams, either a 2-4 machine or a 3-4 machine should be adequate. On the other hand, if you crave super adaptability and versatility then a 2-3-4 serger is the way to go. A differential feed is essential for adjusting the mechanism that is used to feed your material under the needle called a feed dog. If you have a differential feed, you can adjust exactly how the fabric is feeding to eliminate seam ripples, stretching, and puckers. Your stitch quality will be improved, which is crucial any time you work with knitted, stretchy, or very thin fabrics. You can also create ruffled, decorative edging. Most at home sewers will need to use a 4 thread machine, but some sergers in the marketplace use up to 8 threads. Some sergers provide color-coded threading which is incredibly useful for avoiding any damage to your machine that results from a machine that is poorly threaded. Threading can either be relatively simple or a real bear when using a serger. An auto threader is recommended. If the serger doesn't have this feature, you'll want to make sure that your machine comes with either a color-coded path or easy-to-follow clear instructions. If it's in the realm of possibility, try threading your serger before you buy it. Threading isn't just having to get the thread through a needle eye. A thread frequently has to go through multiple channels in a specific order, sometimes in a very hard-to-reach place. If you purchase a manual threader, you'll need to have a pair of tweezers. A beginning sewer can take half an hour or more to rethread a machine, and more experienced sewers frequently require 15 minutes or more. That's why many full time sewists decide to buy a serger that has auto threading capabilities, even if it costs a few hundred more. Sergers should come equipped with adjustable tension, which will allow a sewer to adjust the tension differently for different types of fabric, as well as for a rolled hem. All sergers come with a minimum of 4 threads, but some sergers allow only 2 or 3 threads to be used at one time. Naturally, a 4-thread stitch will be more resilient than a 2 or 3-thread stitch. The most common stitch used by sewers is a 4-thread overlock stitch for clothing seams. Next in popularity is a 3-thread overlock stitch which is slightly less durable than a 4-thread stitch. Many sewers use a 2-thread overlock for finishing up raw edges, to make sure that the edges remain both flat and light. A 2-thread flatlock stitch has been called a faux (fake, imitation) coverstitch. Finally, a 2 or 3-thread stitch is often used for making a rolled hem. This stitch is very decorative and is the preferred choice for hemming lightweight fabrics quickly and easily. Most economically priced sergers will come with a multi-purpose foot, tweezers, and a pack of needles. The list of accessories also may consist of screwdrivers that are necessary for changing needles, scissors, oil, a cleaning brush, or a hex wrench. Sergers that come with a free arm are guaranteed to make the hemming of cuffs easier. Most other attachments are not included and should be purchased separately. Serger Vs. Coverstitch Machine: Do You Need Both? A serger (also called an overlocker) machine professionally finishes the inside part of clothing by overlocking, trimming, and binding seams. It has knives for cutting seam allowances, has two loopers, and usually threads 3 or 4 pathways. These machines are used primarily for chain stitching and for sewing knit hems. It can be equaled by any serger that has 4 or more threads, which makes it a convertible machine that can do both cover stitches as well as serging. A cover stitch machine is a finisher of hems, especially on knit garments. It does this task beautifully and creates nice, stretchy, unbreakable seams. It can also attach elastic, lace, or other trim to any piece of clothing rapidly has only one looper (instead of the serger's two), doesn't have knives for cutting fabric edges, and resembles a traditional sewing machine more than a serger. It uses 1, 2, or 3 needles (usually 3 needles), needs special needles and threads and produces stretchy, decorative and utilitarian seams. It also has a larger work area than a serger. Most professional sewers recommend having a traditional sewing machine, as well as a cover stitch machine, and a serger. If buying 3 separate machines does not fit into your budget, you can buy a combination serger and cover stitch machine that basically will allow you to do a cover-stitch (those stitches that appear on seams and cuffs and permit adjustability and stretching of the piece of clothing). The finished stitches will be comparable to that of a double-needle sewing machine (or cover stitch machine). There are compromises involved in the choice of a combo machine. You won't get a free arm if your serger has coverstitching capability. A combo also won't give you as perfect of a cover stitch or overlock as you would get with 2 separate machines. If you're looking for the best serger home machine, expect to pay between about $200 and $600. The editor's choice, which is revealed directly below, comes in at the low end of the scale at about $225-250. Your cost will depend on the amount of special features, differential feed, color-coded or auto threading, tension adjusters, and extra attachments included. Most of the serger reviews below include machines in the $600 to $800 price range. Why You Should Buy It: Considered the best serger by many consumers, this model is fantastic at finishing raw edges quickly and beautifully. We rated the Brother 1034D 3/4 Thread Serger with Differential Feed 5 out of 5 stars and is an excellent economically priced machine that is the perfect example of a serger or overlock machine. The Brother 1034D binds fabric together using an overlock stitch while cutting the material at the same time. This machine has been specially designed to finish hems and edges on a broad assortment of fabrics, including linens, stretchy fabrics, and formal wear, and also for creating decorative edges and ruffles. This machine weighs 19.8 pounds and measures 11" x 11.7" x 13.2". 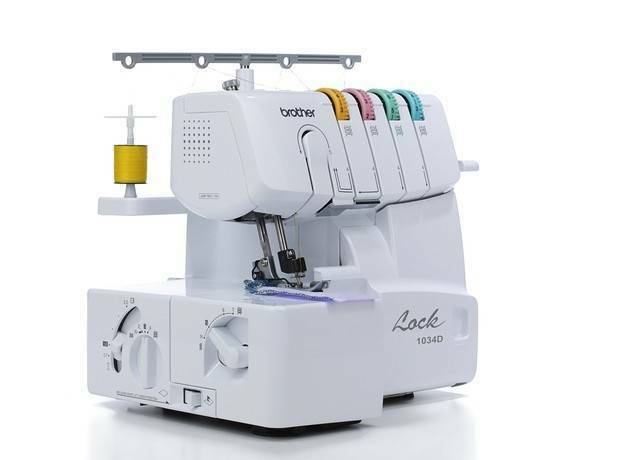 It has a 3/4 lay-in-thread system featuring a lower looper threader, a 3- or-4-thread overlock serger with 22 different stitch functions, a ribbon lock stitch, a narrow hem stitch, and a rolled hem stitch. Sewists greatly appreciate its differential fabric feed which helps beginners and intermediate sewers to achieve more professional looking stitch quality, even on very stretchy or very thin fabrics. The Brother 1034D offers simple threading featuring a lower-looper threading system and upper thread guides that are color coded. It has snap-on presser feet that facilitate easy, quick changes for transitioning to the desired stitch, and optional presser feet can be purchased for sewing flatlock stitches or a blind hem pin-tuck. Why You Should Buy It: This quiet, budget-friendly model comes already threaded with 4 different colored threads and is simple to change from single to double needle. 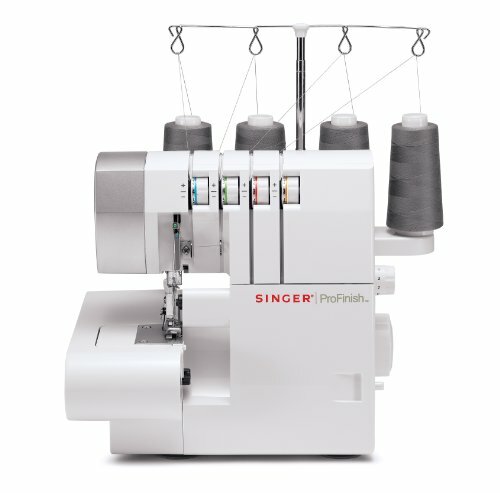 We rated the Singer 14CG754 ProFinish Machine 4.5 out of 5 stars and is a 2-3-or-4 thread-combination differential feed serger which can sew 1,300 stitches per minute, while at the same time providing more stitch variety and less puckering and stretching. This reasonably priced sewing machine sews serge, standard, and 4 built-in rolled hems (perfect for lightweight fabrics), and has an integrated heavy-duty movable upper knife system, an extra-high presser foot lift, a removable free arm that's perfect for cuffs, armholes, and other projects, and a built-in sewing light. The Singer 14CG754 weighs 13.5 pounds and measures 14" x 11" x 11.5". It has an adjustable stitch width and length that prevents bunching on all types of fabric and keeps seams strong, as well as an adjustable tension. Its color-coded threading allows quick and easy set-up by following the diagram printed on the machine. This machine is portable (it has a carry handle) and comes with an assortment of free accessories, including a needle set, tweezers, all-purpose foot, screwdriver, spreader, power cord, foot control, DVD introduction to the machine, and an instructional manual containing a stitch guide inside. Why You Should Buy It: This stand-alone cover stitch machine provides straightforward, beautiful stitches without jamming and easily goes over layers. 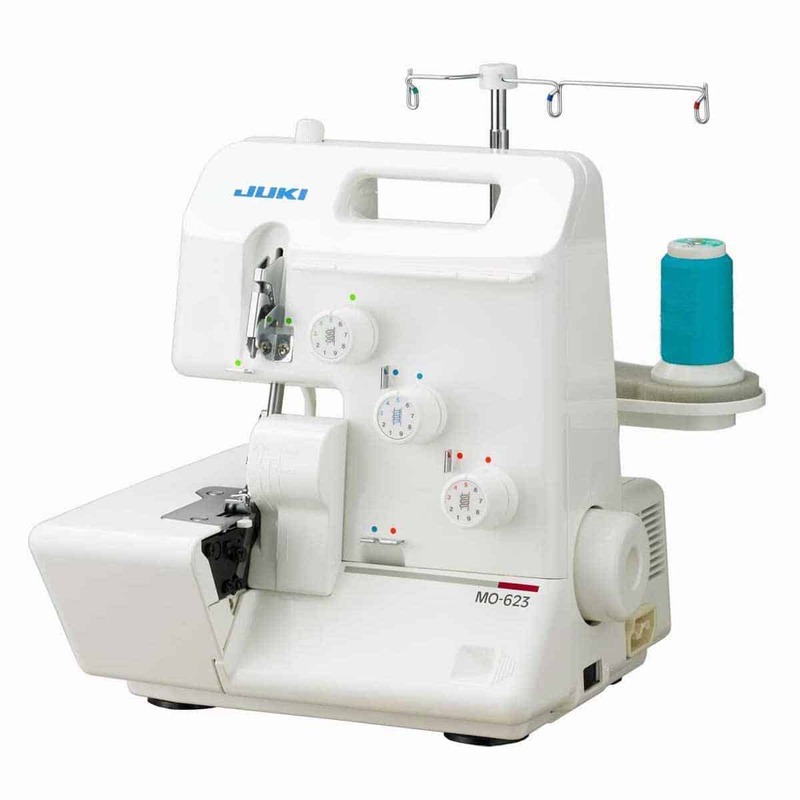 We rated the Juki MCS-1500 Cover Stitch and Chain Stitch Machine 5 out of 5 stars and is a mid-range sewing machine that is perfect for many different applications. It features a cover stitch that stretches and is useful for decorative stitching of necklines, sleeve cuffs, and simple hems and a strong chain stitch that's ideal for stitching both the side seams of pants and the waist. The Juki MCS-1500 weighs 19.8 pounds and measures 15.5" x 13.5" x 14". It has a presser foot lifter that is higher at one end so that the fabric can be easily inserted when beginning to sew. The first position of the presser foot can be raised to 0.393701 in. (10mm). It also features simple looper threading (just press the button) and an adjustable differential feed which permits gorgeous finishes, even when using knit stretch fabrics, sheer silk, or rayon crepe. This machine also features an extension plate with the seam guidelines printed on it, adjustable presser-foot pressure (depending on what kind of fabric is being sewn), and an exterior thread cutter. Why You Should Buy It: This specialty machine is designed to save time and give the intermediate, and advanced home sewer added versatility to produce clothing, home decor items, and accessories. The Janome 1000CPX Cover Pro is a medium range cover stitch machine that comes with all the bells and whistles. This machine has an innovative design that combines a useful home machine with a cover hem machine that is industrial. This combination has resulted in a long arm, heavy-duty, high-speed cover-hem machine that operates like a traditional sewing machine. More than that, the CoverPro 1000CPX has exclusive free-arm configurations, a broad trip cover-hem stitch, and STS, Janome's Seam-Tightening System, making this machine the most advanced cover-hem machine on the market today. The Janome 1000CPX Cover Pro weighs 25.1 pounds and weighs 19.2" x 16.3" x 15.1" and is a dedicated cover-hem stitch machine only, and doesn't include any other overlock, serge, or rolled hem stitches. It comes with a special bonus kit which contains a wide gathering attachment, a narrow elastic gathering-foot, and an adjustable seam guide. This machine has an extra-large bed space of 4" x 5.5", a standard stitch width of 0.23622 (6mm) and a narrow stitch width of 0.11811 (3mm), a 1-needle 2-thread chain stitch, a vertical needle drop, and a 2-needle, 3-thread cover stitch. Why You Should Buy It: This state-of-the-art cover stitch machine is ideal both for finishing interior edges and for attaching decorative edging and strapping for dance garments and swimsuits. The Brother 2340CV Cover Stitch is an advanced quality serger that allows sewers to create a broad range of cover-stitches on all weights and types of fabric for both constructive and decorative applications. The advanced technology of this machine shouldn't be underestimated. It features narrow and wide cover-stitches, a tri-color stitch, easy looper threading, color-coded threading, and adjustment dials for stitch lengths. It has snap-on feet, a presser-foot dial, and a differential speed that lets you alter the speed that your fabric feeds through the machine. This machine weighs 16.8 pounds and measures 13" x 15" x 13.4". Using 1 looper thread and 3 needles, the 2340CV creates decorative stitching, chain stitch, and professional hems. In addition, the Brother 2340CV has simple to follow lay-in threading, a slide lever adjustment, a 2 needle 2-3-4 thread cover-stitch, and a maximum sewing speed of 1,100 stitches per minute. It comes with a number of accessories - 4 thread nets, an accessory bag, needle set, tweezers, 4 spool mats, 4 spool caps, a hexagonal wrench, a cleaning brush, a soft cover and an operation manual. Why You Should Buy It: This portable serger is reasonably priced, quiet, and easy to thread, and does a remarkable job sewing heavier fabrics like fleece. We rated the Juki MO644D Portable Serger 4.5 out of 5 stars and is a powerful household use machine that has many of the qualities of an industrial sewing machine. It features convertible 2-3-4 thread overlock serging in addition to having an automatic rolled-hem capability, a breakaway looper, and color-coded threading. In addition, this machine provides a differential feed and an adjustable stitch length that is very helpful whenever there are ruffles or waves in the stitching. The Juki MO644D weighs 18.6 pounds and measures 10.6" x 13.4" x 11.6". It comes equipped with a multi-purpose presser foot which allows sewing a great variety of stitches, in addition to sewing products including elastic and tape, sequins, or ribbons. Stitch length, serger knobs, and differential feed are located inside the machine on the left-hand side whenever the cloth-bed is opened up. This machine is excellent for both beginners and experienced sewers and creates elegant evening wear or simple sportswear with ease. Tension adjustment is easy with the one rotation thread-tension dials. It also has a heavy-duty knife system that ensures easy, consistent cutting of both heavy and lightweight fabrics. This model has a brightly lit needle and fabric area, and flip and roll automated rolled hemming. Why You Should Buy It: This serger is economically priced, easy to thread, and provides well-formed stitches at lightning speed. The Janome 8002D Serger is a sturdily designed compact machine. This model features a well-defined Janome stitch mechanism that provides high quality 3 or 4-thread operation, adjustable stitch length and cutting width, and speeds up to 1,300 stitches per minute. It also features a built-in rolled hem (no plate change needed) that guarantees a professional finish. Other components of this machine are a simple-to-read color-coded threading chart, an electronic foot, whisper-quiet operation, and an extra-high presser foot lifter. This machine weighs 18.8 pounds and measures 17.5" x 17.5" x 17". It has external color-coded tension dials that make threading a snap, adjustable foot pressure, a lay-in thread tension dial, and a readily retractable upper knife. This model includes a bonus bundle with a premium Janome needle threader and two packs of size 11/14 Janome assorted needles. The Janome 8002D sews all natural fibers (wool, cotton, linen), fine fabrics (velvet, satin, taffeta, silk), knits, upholstery, and synthetic fabrics like rayon or polyester blends). It also does a fantastic job of sewing suede and leather, reptile skin, fur, twill, canvas, rubber, plastic, and any other multiple layered or extra-thick fabrics. Why You Should Buy It: This serger is exceptionally well designed, includes all the features that longtime users have been asking for, and is sturdy, well built, and versatile. We have rated the Brother 3234DT 4.5 out of 5 stars and is a quality high-performance 2-3-or-4 thread serger that reliably delivers professionally edged finishing on a broad assortment of fabrics. This machine edges woven fabrics and knits, creates gathers, decorative edges, and ruffles, serges spaghetti straps and narrow sleeves, joins laces, and much more. The Brother 3234DT weighs 20.1 pounds and measures 11" x 13.2" x 11.7". Sewers love the versatility of working with 2 threads (in addition to 3 or 4 threads) since they can sew more delicate fabrics. Included with this machine is a standard foot, gathering foot, blind stitch foot, a wide table, a soft cover, and other useful accessories. This machine is user-friendly, easy to thread and use, features color-coded lay-in threading, and includes an excellent printed manual and instructional video. It features a lot of storage space, an extended table, a narrow cuff feature, a trim basket, free arm, and much more. It has a full spectrum LED light that provides a more natural (not yellow) light, a fantastic needle threader, and everything is labeled and well laid out. Why You Should Buy It: This basic 3-thread machine is very reasonably priced, runs smoothly, and produces first class results at very high serging speeds. The Juki MO-623 1-Needle, 3-Thread Overlock Machine is an economical home serger that is perfect for beginner, intermediate, and experienced sewers. It features 3 threads for overcasting, adjustable cutting width and stitch length, a knife-cutting mechanism that assures easy, consistent cutting of both heavyweight and lightweight fabrics, and has a speed of up to 1,500 stitches per minute. This machine weighs 20 pounds and measures 15.7" x 13.7" x 14.5". It is a reliable, simple to operate, durable machine that has a 2/3 thread overlock and features built-in, flip a switch rolled hemming. It has color-coded threading guides with clearly marked thread paths, one rotation thread-tension dials with highlighted normal tensions, and a multipurpose presser foot that lets sewers create overlock stitches in addition to adding elastic, tape, sequins or ribbons to any item. In addition to all the features listed above, the Juki Garnet Line MO623 Serger / Overlock Machine has a completely self-adjusting upper knife, a bright sewing light, a sewing width gauge, and a presser foot lift. Beginning and intermediate sewers who want a good performing mid-level machine and don't require more than its 3-thread ability will be well pleased with this serging machine. Why You Should Buy It: This fine, midrange serger uses standard home sewing needles, a retractable knife, simple color-coded threading, and more to provide sewers with a high-quality functioning machine. We rated the Brother Designio Series DZ1234 Serger 4 out of 5 stars and is a specially designed machine for cutting and finishing projects simply and rapidly. This machine features a differential feed using both a 3 and a 4 thread arrangement which enables better stitch quality for a large assortment of fabrics. The DZ1234 Serger comes with a gathering foot, piping foot, blind-hem stitch foot, and two complete sets of starter thread for creating beautiful hems and edges on many different types of fabrics, including linens, stretchy fabrics, and formal wear. This machine also allows you to create your very own piping using piping cord and fabric strips. The Brother Designio DZ1234 weighs 18.1 pounds and measures 15.2" x 13" x 13.2". It is a midrange priced machine that is a whiz at quality serging. The gathering foot snaps on and facilitates simple gathering, edge finishing, and fabric connecting in one easy step. A channel built onto the foot secures the material, which eliminates needing any pins to gather both single or double-layers of fabric to create a serged edge. It has an open-toed, adjustable guide which is perfect for both utility stitching and for embellishing, sews up to 1,300 stitches a minute, and features stitch width control. 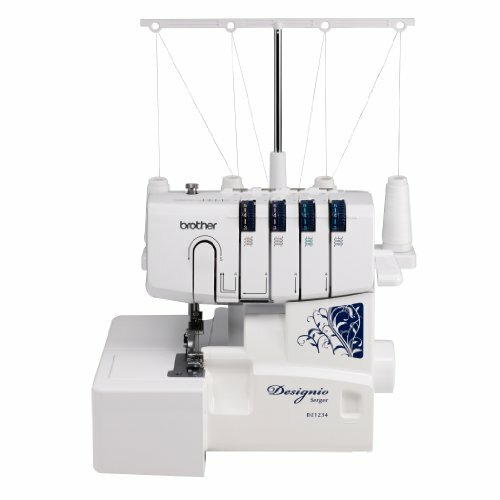 After reviewing a multitude of available sergers, our editor's choice is the Brother 1034D. This quality economically priced machine is the perfect choice for all types of fabric as well as home decor, and it provides a finished, commercial-grade look to all of your projects. It has a color-coded guide, 3 accessory feet (gathering, blind hem stitch and basic multipurpose), has an adjustable differential feed, stitch width, and stitch length, and can be used with 3 or 4 threads. It has 22 different built-in stitch functions, including ribbon lock stitches, specialty stitches for bridal and formal wear, crafts, home decor, and reinforced tape applications. This serger is simple to thread and straightforward to use and comes with a printed manual, instruction video, numbered and color-coded lower and upper loop threading, and has a 25-year limited warranty and free phone support for life. It also comes with a foot controller, needles, a soft cover, 2 snap-on feet, and more. I looked on your site for help with buying a serger. Your recommendation suggest Brother and Singer. I have purchased both brands. Using both between 9 months to a year, both broke down. Do any of your staff see on a regular basis? If they do then the reviews of these products would not be included in the top 10. The constitution of the sergers is poorly constructed and not made to last. Please reconsider testing these products. Hi and thank you for the comment. Our top 10 lists are based on many factors, one of which is the price of the unit. The more expensive machines offer more options and typically last longer (but not in all cases). Our list is based on personal experience, other user reviews and value per dollar spent. I hope that helps to clarify the list a bit for you. Thanks again. Thanks for your thorough reviews! I see the Brother 1034D 3/4 Thread Serger With Differential Feed now has a newer model released in the last few months. Do you have any thoughts on whether the newer model would be worth it? It appears most of the features are very similar with a few upgrades like an LED light vs regular incandescent. Do you think a newer model is worth the additional dollars? I haven’t checked it out yet. I will over the next few months and offer my opinion…thanks for commenting!!! The JUKI MO644D is the perfect machine for beginners with a very simple and easy to understand instructional manual….I really like it. This SINGER 14CG754 ProFinish Serger is quite budget-friendly. The serger also comes already threaded with 4 different colored threads – which is great. I love using it on my materials because with just one motion you can finish an edge, sew a seam, and trim off any excess fabric!. I think I’ll also give the Brother 1034D 3/4 Thread Serger with Differential Feed a 5star rating. Though it’s kinda stressful using the stitch switch, it’s still a very useful machine which allows me finish hems and edges on almost all linens, stretchy fabrics, and formal wear. It’s also helpful for creating decorative edges and ruffles. It’s just the perfect Serger machine. For finishing interior edges and for attaching decorative edging and strapping, I use my trusted Brother 2340CV Cover Stitch. It actually sews perfect necklines, armholes, or hems without ironing and is very great for t-shirt hemming. Janome 8002D Serger is a great machine which comes with a DVD containing an instructional video to help you on your sewing journey. It doesn’t vibrate or make noise even on high speed which makes it good to use at any time of the day. I love the added table length too! The 1000CPX was given to me after I finished fashion school. It has really been very helpful for me. I knew it was not for beginners but I was still able to still use it. 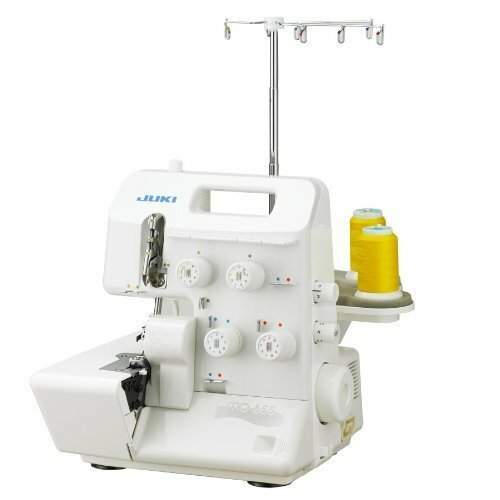 An economically priced, easy to thread serger that I use and recommend is the Janome 8002D. It provides well-formed stitches at lightning speed and is very simple to operate. I don’t care about price. I want to buy my wife a good product as a graduation gift (Doctoral Degree) and I am still not sure what to buy after reading these reviews. I just recently became aware of Sergers and know for sure she wants one. Willing to spend more than a grand. Help! The JUKI MO644D is good for beginners, reasonably priced, easy to thread, and does a good job sewing heavier fabrics. I use it on very thick sweaters and the result is really good. I too just finished school and I am looking for the best serger possible that does just about anything and as the gentleman wrote earlier the money does not really matter . The 1034D serger has been my number one machine as soon as I bought it. When I got it first, I had no idea where to begin. But the instructional video was quite helpful and it really helped me through the entire whole process. Not to mention that the customer support is superb!